Most of you know how much I love my pets. I had a couple of customers tell me that they would "take care of" my rats or introduce them to their cats (in jest, but I would not label everyone as a rat lover). First off, my rats, while spoiled scared-y rats, are quite large things. They are reasonably fearful of cats, most cats don't know what to do with them because they are so large. Remus weighed in at 1.83 pounds (he's my chub-ster). Romulus is a little slimmer, but longer. "Two-handed rats," I call them; you need two hands to hold them. Second, I love my rats more than I like most people and I will take you down if you hurt my fur babies. So a couple of months ago, I found a little tumor on Remus' side. There also may or may not be a little lump on his abdomen? It kind of comes and goes. My mom said it might be some sort of fat tumor because they can do that (apparently--don't look at me, she's the nurse). Crushed, I took him to the vet who actually said that she would expect a good outcome and recovery because it is still small and it is conveniently located for removal. It is a little pricey, estimated 200-400 depending, but she expected closer to 200. My money is a little tight with just finishing school, going on that moving trip, and trying to save up for our vacation later this summer, but I want to do this sooner rather than later, so I made an appointment for Monday. Remus is still fairly young--a little over a year and a half old--so he could still have nearly two more years if we are lucky. The main thing I worry about is that Remus is such an anxious little thing. He always has been. And he is often a one-woman rat (that woman being me, obviously). Romulus is a little more social (though obviously attached to me), but Remus has always been a pretty nervous critter. I feel horrible that I am separating him from his braver brother to give him to strangers for at least one full day, maybe longer, who will hurt him (he won't be able to understand that they are trying to help), and he will have to go through all of it without me or his brother (who he has never been separated from). And that thought breaks my little heart. I hope he will forgive me! And I hope Romulus doesn't get too lonely. They are funny rats. 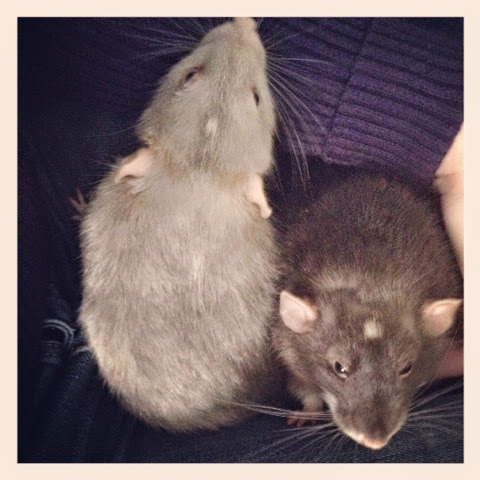 People talk about having dominant rats, but I honestly cannot say which of these two is dominant. 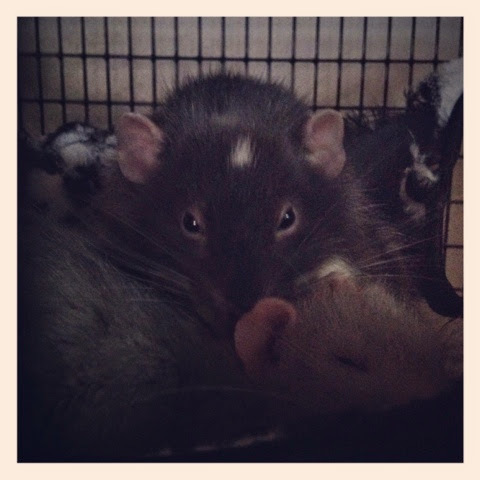 They are both willing to push each other around and Romulus is a very forward rat. In the rare cases where they have a little fight, they take turns being the aggressor. 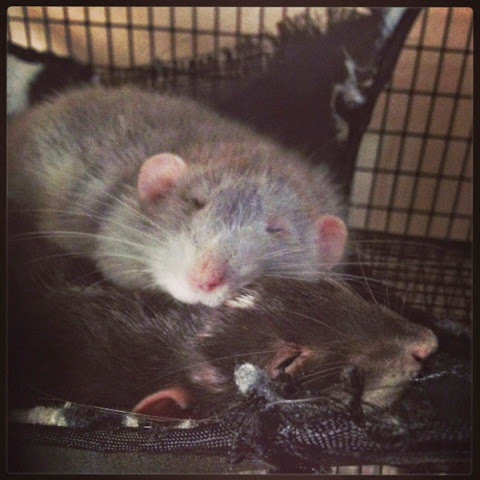 However, Remus does hold Romulus down and forcibly washes his head (hence Romulus' bald spots...) and Romulus will squeak, but not put a stop to it, which I was told shows that he is not the dominant rat. I wonder how their relationship will change with this surgery. The vet said that they can spend some time together, though not right away, as long as it is supervised. Poor ratties. Anyway, the point is that I love my rats and I am sad that Remus has a tumor (I hope he doesn't get more) and I hope that they will be alright. I bought different bedding and am trying to prepare for Remus' surgery. The vet office that I go to is great. My family has taken our pets there for years. They are called Mesa Veterinary Hospital. Here is their website: Mesa Veterinary Hospital. On a related note: it makes me sad how few people catch the Romulus and Remus reference. Some people catch on that Remus is also Harry Potter's Remus Lupin, who was, I believe, named after the Roman Remus. People need to take more history classes.